In the early days of Google Earth, our concept was to develop a 3D virtual globe on which people could view and share information about the world around them. Its ease of use and accessibility both integral to this development. Our passion, was to design an immersive and flexible tool that when placed into the hands of local experts -- whether an organisation or individual would be of an unparalleled value to anyone who cares about planet Earth. One such organisation that has adopted this initiative is EarthKnowledge, by creating their Earth Knowledge Portal. 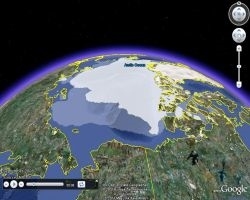 Using Google Earth, EarthKnowledge "is an innovative way to view global news and information. The Portal collects, integrates and disseminates key natural, social, and economic environmental information of the day". A number of narrated tours for Google Earth created by the Google Earth Outreach team have been shared with EarthKnowledge. In this suite of tours, some of the world's most authoritative figures such as Al Gore and Ted Danson, guide you through key issues facing the planet. By combining this infrastructure with some of the world's leading information sources, such as Appalachian Voices, the BBC Global Heritage Fund, Greenpeace, NASA, Scripps Institution of Oceanography and The United Nations Framework Convention on Climate Change, the EarthKnowledge portal organises geographically vast volumes of information. In our opinion, this breadth of data and ease of exploration gives us the ability to understand. With the act of understanding giving us the ability to make an informed choice and take responsibility for our own "home", we're so enthusiastic about EarthKnowledge's efforts to provide this to millions of people around the world. Google Map Maker gives maps a personality. A map's power is increased when combined with the knowledge that human collaboration can impart. This can prove particularly useful for non profit organisations working in countries where mapping data is still very limited. Through the addition of the "where" component to a piece of information, its meaning is enhanced. Once this has taken place, so can follow with greater efficiency the who, what, when and why. Last week, Google Map Maker for the United States was introduced. This launch expands upon the exisiting wealth of knowledge held by people and shares it with all anyone interested in maps, and how they can help them to understand through geography. If your country is covered by Google Map Maker, we encourage you to join this global community of contributers to cartography and add a part of yourself to the map. This fascinating geographical annotation allows you to see live mapping edits by users around the world! As this community of geographical pioneers continues to grow, learn what is already going on in the world of map making by visiting the Google Latlong Blog! OK, back to work people. There are maps to make! We'll see you next month! In the mean time, you can stay in touch with the latest news from @earthoutreach on Twitter!